I’m often asked how the opportunity to illustrate Hababy’s Christmas Eve came about. How did I meet Jamie? And how did he decide to work with me? I met Jamie Farr when he was touring to promote his autobiography, Just Farr Fun. I was living in Raleigh at the time working as the Community Relations/Events Coordinator for Barnes & Noble Booksellers. My job was to coordinate events and ensure that author book signings went smoothly. Jamie Farr drew quite a crowd as M*A*S*H fans flocked the store to meet him and get books signed. Jamie’s schedule had him staying in Raleigh for an extra day before heading to his next signing, so my job expanded to include accompanying him around town. Throughout the day he asked about my future dreams and discovered that I loved to illustrate. A few months later, he called me at work to ask if I would be interested in illustrating a children’s book he and his wife had written. I had illustrated many smaller items such as greeting cards, album covers and short stories, but this would be my first full-length picture book. Needless to say, I was excited to be provided the opportunity. Jamie and his wife Joy described the characters to me and I prepared two test illustrations. The first test illustration was a close up of Hababy and his parents, focusing on their faces, with the night sky behind them. 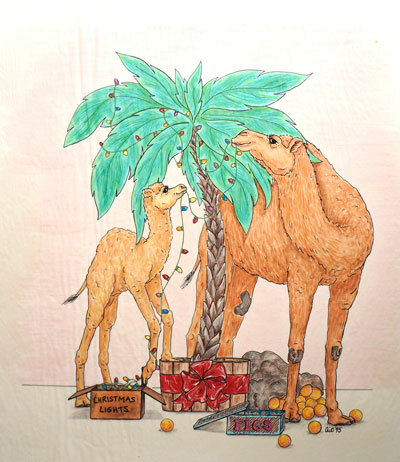 The second was Hababy and his mother decorating the Christmas palm tree. In the story, Hababy’s father decorates the tree which I didn’t know at the time of the test illustration. My visions for the characters matched theirs, so soon the text arrived and I set to work illustrating the scenes and laying out the book pages.